Give raw wood and base-coated pieces the royal treatment by sanding their urfaces. Our short course shows you how to sand with success. In the instructions for projects featured in Better Homes and Gardens crafts magazines, we tell you to sand all wood surfaces before and after you seal the wood. We also often include a step for sanding the base-coated surfaces with a paper grocery sack. And when you finish a project, we recommend that you sand paint or varnish from surfaces you'll join with glue or 5-minute epoxy. All of these steps -- no matter how tedious -- are necessary for creating smooth, long-wearing surfaces and tight joints. Ignoring them can compromise the overall appearance and longevity of your painted project. Here are some strategies for making the sanding process simple and stress-free. If you cut your own wood, choose stock from your local lumber supplier that's free of defects such as excessive planer marks. If you plane your own stock, adjust your machine properly, and use sharp knives for best results. Likewise, keep your saws tuned up and use high-quality, well-sharpened blades. Whether you sand with a power tool, for instance a belt sander, or a hand tool such as a sanding block, it's best to use the grit that's specified in the project instructions. The grit number (or mesh number) refers to the particle size of the abrasive mineral, from 36 grit (the most abrasive) to 600 grit (a very fine sandpaper). The sanding products you're most likely to use fall within the 100- to 220-grit range. These grits will work fine as long as you start with good-quality stock. 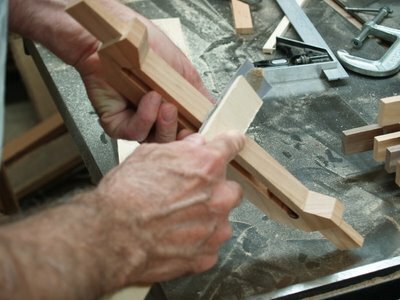 Hand sanders: Custom-make your own sanding blocks by wrapping the abrasive around a block of hardwood. Foam sanding blocks work great on rounded surfaces because they're easy to grip. For hard-to-reach areas, attach abrasives to small wooden shapes, such as dowels, pieces, and curved or rounded blocks. Power sanders: You'll find a wide variety of tools on the market, including belt sanders, finishing sanders, random-orbit sanders, and detail sanders. Each sanding tool has unique features; choose the ne that works best for your project. This is one of the easiest rules to remember when sanding. Going against the grain can create visible scratch marks. Pay close attention to a project that has four joined sides. Where the end of one piece meets the edge of another piece, you'll want to sand right up to the joint without crossing it. Sand the edge last, being careful to sand with the grain. 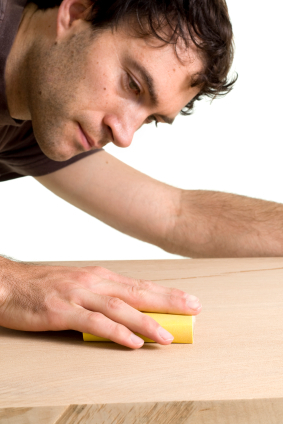 Begin by sanding with the grain with 100-grit sandpaper to remove the deepest scratches from the wood. Then sand with 150-grit sandpaper for a smooth, uniform surface that will evenly absorb the paint. For base-coated surfaces, we recommend sanding with paper cut from a plain paper grocery sack before continuing to paint details or applying varnish.This is by far the finest-grit sandpaper around, and it will remove any fuzz raised by acrylic paint without leaving scratches. Be sure to use the plain side of the sack; the ink on the printed side could rub off onto the project surface. You may crumple the bag before using it to make the paper more pliable. If you do, crumple it and then flatten the piece so there are no hard folds or edges. Once you complete all sanding, remove the dust with a light sweep of a tack cloth. (Do not rub the surface with the cloth; you'll leave a sticky residue.) Then hold a light at an angle over the piece (or place the piece near a window) to inspect it for scratches. Sand again as before until the surface is smooth and scratch-free. All adhesives bond best to clean, dry, bare wood. Sand painted or varnished parts to expose bare wood in the gluing areas. Then remove dust from the surface, but don't rub the surface with a tack cloth -- the wax residue will prevent an effective bond. More Dust free sanding of wooden floors seasoned pet stains may have leaked into the wood and the sub- flooring, which implies you have to sand the wood to figure out the degree of the harm. Sand the stained hardwood flooring until you achieve a point that is not stained or on the off chance that you discover the stain is excessively profound. Excellent post. I have read your post. I found this post to be very informative and helpful. I will have to recommend you to my friends. If the percussion usually are tilted this belt will probably either push in the direction of this within the rollers or ease off all of them completely. In the event the rollers usually are inadequately aligned correctly, they can likewise push this belt in place in the direction of this homes that may damage both homes along with the belt. Somehow this instruction didn't work with me. I tried to follow every step of it, but the result was not as I expected. However, thanks for sharing! All of these steps which you show are necessary for creating smooth, long-wearing surfaces and tight joints. Great post! I'm found many information here. Thank you for stressing the importance of looking for scratchs. I made this beautiful wooden bowl for my father in law just to have my woodworking husband tell me i made a mistake. How emberassing!